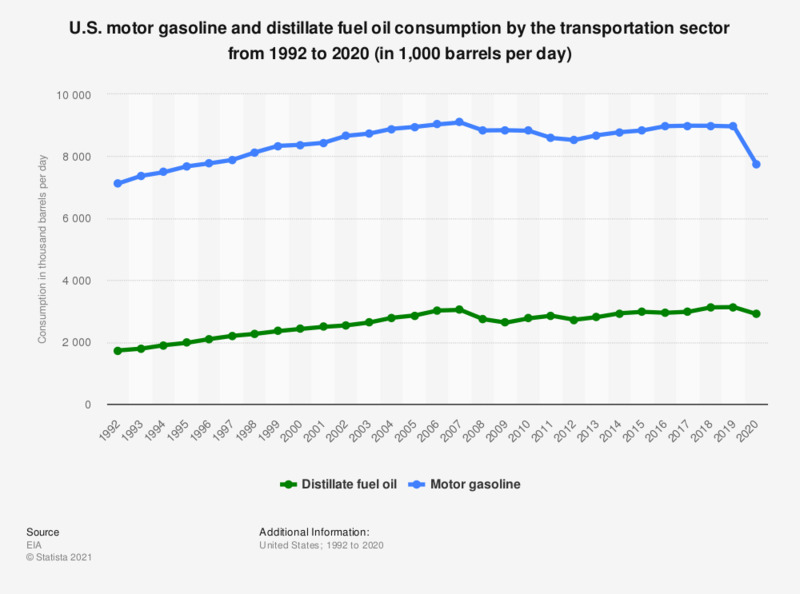 The statistic represents the motor gasoline and distillate fuel oil consumption by the transportation sector in the United States from 1992 through 2017. In 2017, the U.S. transportation sector consumed nearly three million barrels of distillate fuel oil daily. Gasoline and fuel oil and diesel consumption in the U.S. The transportation sector, which includes public and personal transportation by road vehicles, airplanes, trains and ships, is the second largest energy-consuming sector in the United States. Distillate fuel can be used as either a fuel oil or a diesel fuel. The figures indicate that gasoline is still the most popular transportation fuel in the U.S., as consumption of this fuel is almost three-fold higher than fuel oil and diesel consumption. While gasoline is most commonly used in cars and motorcycles, diesel is the fuel of choice used in trucks and buses. Gasoline and fuel oil and diesel fuel consumption in the U.S. reached its peak in 2007, when the U.S. transportation sector consumed just over three million barrels of distillate fuel oil daily and over nine million barrels of finished motor gasoline per day. Thanks to government incentives, annual biofuel consumption in the U.S. increased from around 260 million gallons in 2010 to about 1.48 billion gallons in 2015. Texas, where biodiesel in blended fuel is exempt from the diesel fuel tax, is the U.S. federal state with the highest consumption of diesel and alternate fuels, but California, Pennsylvania and Ohio are not far behind.